Finally I can show-off a white French car I’ve had for quite some time. I’ve shown a rally-spec Peugeot 205 Turbo 16 before, maybe even several (I clearly remember the Grand Raid that competed in Paris-Dakar). French Friday: Paris-Dakar dans Amérique du Sud? But showing this one is a bit odd to me. As I usually show 1/43s and 1/64s. And this one, Ottomobile’s 1/18, is way bigger. Making my usual shooting ornaments and skills otiose. No-good. So bear with me. As it is a glorious roadlegal 205T16 Stradale, a true homologation special. And Otto did a great job replicating it. The choice for white seems a bit odd though as they all were of a darker greyish color. Except for... VIN P1. The first one ever built (partly by Heuliez). Built for Demonstration purposes. Not sure if it was used as a press car as I really only remember the grey one acting in magazines back then. 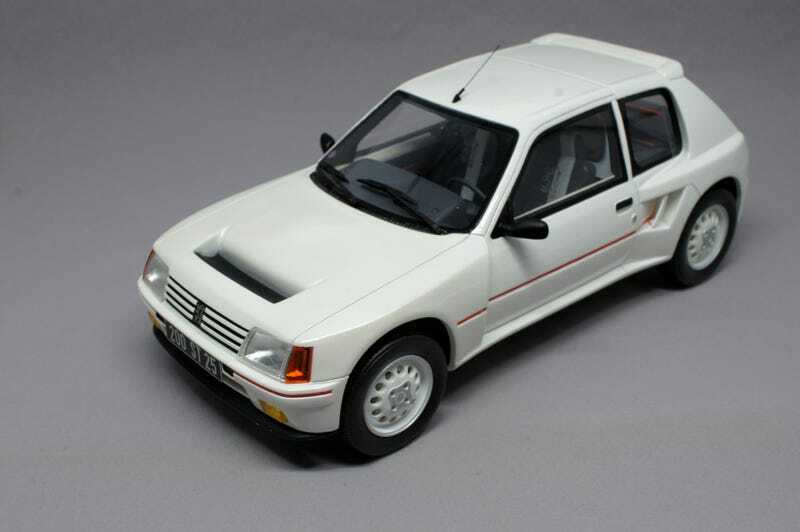 This always has been my favorite Groupe B car (although it has been slighty shifting to the R5 Turbo last couple of years) so I’m glad I found the Otto way after it was released for a decent price. And that’s it for today, if it is any good as the red day yesterday it’s gonna be insane! Bon Lundi, bon jour blanc!